The Rangers board say Dave King and Richard Gough are "displaying twisted logic" by urging fans not to hand their season ticket money over to the club. Former Ibrox director King and ex-Rangers captain Gough set up the Ibrox 1972 Fund for fans to pay into instead. Backed by a supporters group, the pair want club property put up as security to safeguard season ticket money. 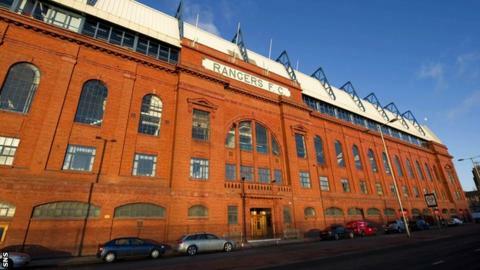 "The board has stated that it has no intention of granting security over Ibrox to anybody," said the club. "We have already shown in our actions - and not words - that our stadium is sacrosanct. "Any supporters considering engaging with Ibrox 1972 Ltd should be clear that as the club will not grant security over Ibrox to any such organisation, there is no prospect that any commitment to this new scheme will ever come to fruition, and is therefore entirely meaningless. Nor will the board enter into any agreement with a third party organisation on season ticket renewals, as is being suggested. "Therefore this scheme is a worthless academic exercise created to serve the purposes of individuals and not the greater good of Rangers Football Club. It could never deliver the stability and security this football club and our supporters deserve. "Season ticket sales are the largest single source of income for Rangers and only the club and the team will suffer if some of this income is withheld." The Union of Fans, a collective of Rangers supporters groups in favour of King's plans, insist the fund it not an "attempt to deprive the club of funds". "No money will be taken from fans unless security is granted and we are of the opinion that the board's reluctance to discuss granting security may well rapidly change," the group said. The board defended chief executive Graham Wallace, who has been under fire from King and fans following his 120-day review of the club's books. "The absurd attacks made by individuals associated with this new scheme on chief executive Graham Wallace are disgraceful," Rangers added. "Since Mr Wallace joined the club he has worked tirelessly to create a Rangers fit for the future. Mr Wallace has the board's unequivocal support." The Union of Fans say their comments about Wallace "are not personal" but are rather criticisms of his "pronouncements". Meanwhile, former Rangers manager Alex McLeish has backed King's attempts to wrestle control of Rangers from the current board. However, McLeish stopped short of endorsing the plan for supporters to withhold season ticket money. "If it puts [the club] in danger of administration then no but then again if it's to save the assets with Dave King coming in there are pros and cons," said the 2003 treble-winning Rangers boss. "I'm trying to get as much information about the situation as I can."